Opposition leader Leopoldo Lopez was found guilty of inciting violence during protests in 2014. 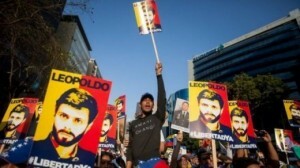 CARACAS – Protest marches staged Saturday saw hundreds of Venezuelans demanding the release of opposition leader Leopoldo Lopez on the third anniversary of his arrest. The annual demonstration took on additional momentum after US President Donald Trump met with the activist’s wife and his administration slapped drug sanctions on the country’s vice president, freezing his US assets and banning him from entering the country. In Caracas, one group of protesters held up signs reading “No More Dictatorship” and blocked traffic along the main highway as the opponents of President Nicolas Maduro gathered at different points throughout the capital. Also on Saturday, the US State Department repeated Trump’s call for Lopez’s release after meeting with the Venezuelan opposition leader’s wife in the Oval Office. Former President Barack Obama had also called for Lopez to be freed. Last week the Trump administration imposed sanctions against Venezuelan Vice President Tareck El Aissami, accusing him of being an international drug kingpin. El Aissami is the most senior Venezuelan official ever to be targeted by the US. Last year, Lopez was sentenced to nearly 14 years in prison in a trial marred by irregularities for inciting violence during anti-government protests. Venezuela’s Supreme Court upheld the conviction last week in the face of widespread condemnation by many foreign governments and the United Nations, which consider Lopez a political prisoner. In comments made by Lopez in jail and passed along by family and lawyers to Colombian newspaper El Tiempo, the opposition leader said he had no regrets about his decision to turn himself in rather than seek exile, as he claims the government had offered.